Deep local roots and an international presence. Throughout the world we inspire private individuals and financial intermediaries with our personal asset management and investment consulting services. VP Bank Group was founded in 1956 and has grown from a company for intermediaries into a globally active bank. At our international locations we have around 800 employees managing assets totalling roughly 42.9 billion Swiss francs. Our core competencies are private banking and business with financial intermediaries. We offer tailor-made asset management, investment consulting and wealth planning for a sophisticated private clientele. At the same time we are a long-established partner for financial intermediaries, who appreciate our many years of experience and our modern infrastructure. Aside from these core capabilities, we maintain an international fund competency centre. A worldwide network of partnerships supports our client advisors with outstanding international expertise. Thanks to our sound balance sheet and capitalisation we boast an "A" rating from Standard & Poor's. Our continuity and independence are guaranteed by our three anchor shareholders: the "Stiftung Fürstl. Kommerzienrat Guido Feger" foundation, the "U.M.M. Hilti-Stiftung" foundation and the "Marxer Stiftung für Bank- und Unternehmenswerte" foundation. 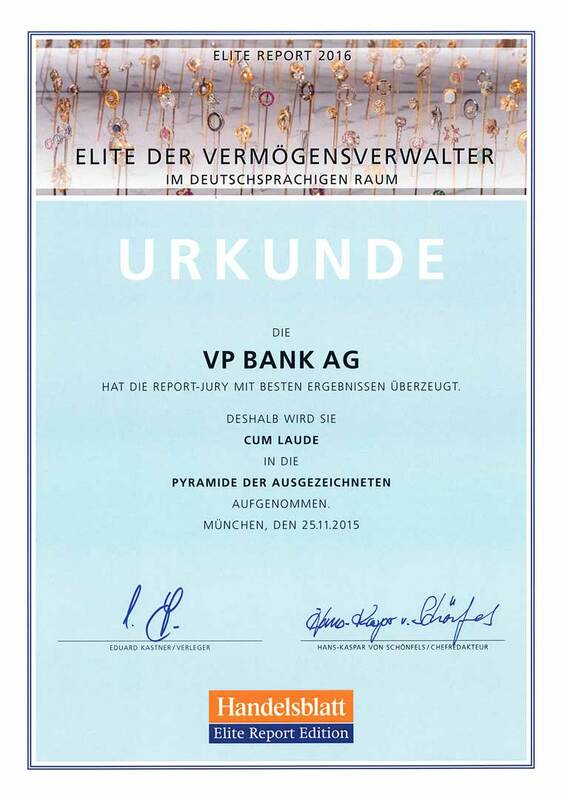 VP Bank Ltd, with its registered office in Vaduz, is the Group's parent company. It offers convincing solutions with a personal touch in asset management and investment consulting for private and institutional investors and in credit business. VP Bank (Switzerland) Ltd is a wholly owned subsidiary of VP Bank Group. Its core competencies are asset management and investment consulting for private and institutional investors. VP Bank (Luxembourg) SA in Luxembourg is a wholly owned subsidiary of VP Bank Group. In addition to asset management and investment consulting, its core competencies include the pan-European distribution of investment funds. VP Bank Ltd Singapore Branch is a branch of VP Bank Group. Its core competencies are asset management and consulting for private clients and a broad service offering for external asset managers. VP Wealth Management (Hong Kong) Ltd is an wealth management company and representative office of VP Bank Group. It concentrates on wealth management and family office services for wealthy private clients. The numerous awards we receive every year are testament to the quality of our advice, products and services.